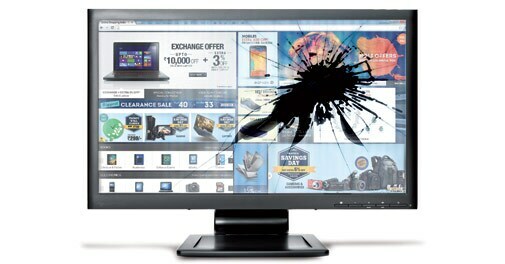 Consumer electronics companies protest the massive discounts offered by online retailers. Online retailers such as Flipkart and Snapdeal were once the darlings of consumer electronics makers, as they helped boost sales. But the manufacturers are are now locked in a dispute with the retailers over pricing discounts they offer on products such as cameras, mobile phones and laptops. Chinese computer maker Lenovo, Japan's Toshiba and Sony, and camera makers Nikon and Canon have either blacklisted e-retailers or cut warranties on products being sold on these sites. Lenovo has put up a notice on its India website that says Amazon.in, Flipkart and Snapdeal are not its authorised resellers. Nikon has even slapped a legal notice on Flipkart for under-pricing its products. To be sure, the dispute isn't new. But it has intensified in recent months. In September 2011, Sandeep Amar, Head of Marketing and Sales at Times Internet Group, wrote in a blog post that e-commerce portals had become "a headache" for most brands as they were selling a lot of products below the market operating price. The market operating price is the lowest price that retailers can offer on products. Manufacturers prescribe this price to maintain their margins and keep pricing consistent across their sales network. Online retailers, however, are selling many products below the market operating price by offering discounts. "These discounts are absorbed or shared by online sellers and websites," says Panasonic India Managing Director Manish Sharma on email. A local handset maker's founder, who does not want to be named, says online marketplaces such as Flipkart are offering discounts by pumping in money into the business to improve sales and increase their valuations. There are two other reasons for the dispute. One, online discounts hurt brick-andmortar retail stores that account for more than 90 per cent of the electronics goods sold in the country. And two, many manufacturers have started their own online stores. Godrej, Whirlpool and Next Retail have their own direct online channels while Lenovo's website directs buyers to thedostore.com, an online seller. Nokia and Samsung also have dedicated sellers. P. Balaji, Nokia's Managing Director in India, declined to comment saying only that this was a "very sensitive" matter. Though the discounts benefit consumers, many manufacturers have protested the undercutting by online retailers. Micromax, which a year ago launched its Canvas 2 handset on Flipkart, is engaged in talks with e-retailers to resolve the issue. "We are dissuading the portals from discounting below the price provided by us. In case it continues we will be forced to terminate our partnership agreement," says co-founder Vikas Jain. Some manufacturers have been more aggressive. Canon, for instance, is offering an 18-month warranty on cameras bought from its stores compared with one year on products purchased online. Canon India executives could not be reached for comment. The move has riled e-retailers. "How can you have differential warranty if a customer has bought a genuine product and paid full taxes? And how does it matter if the customer has bought it online or from a physical store," asks Devesh Rai, founding team member of ShopClues, an online marketplace. Rai adds that shops at Nehru Place in New Delhi, the go-to destination for computers and accessories, often sell products below the market operating price but consumers still get full warranty. Online retailers defend the prices offered on their websites. Amazon.in said in an email that sellers on its website "independently decide" their product prices. "Customers of Amazon.in enjoy 100 per cent guarantee," it says. These retailers also seem to be ignoring the warnings. Even after the Lenovo notice, which also asks buyers to check the warranty status on Flipkart, Snapdeal and Amazon.in, the Lenovo Essential B490 laptop sold on Flipkart is offering a one-year warranty. The dispute, however, has started denting the trust of online buyers. This is worrying given that the Indian e-commerce industry is still nascent. Shreya Narayan, a Mumbai-based actor who is an avid online shopper, recently bought her new mobile phone - an Apple iPhone 5S - from a retail shop after reading about warranty-related issues in newspapers. "I can't take a risk after spending half a lakh rupees to buy this phone," she says. The pricing controversy notwithstanding, manufacturers agree they cannot ignore ecommerce companies. Online retailing is a fast-growing industry. Crisil Research expects it to grow 50 to 55 per cent annually to become a Rs 50,000 crore industry by 2016. "It will be foolhardy to ignore online sales and online sites," says the handset maker founder quoted earlier without name. "But we will have to regulate them, as they are cannibalizing our offline business." Is Finance Minister P.Chidambaram an incurable optimist?